The opening ceremony was led by Dr David Honeybourne, Chair of Heartlands Cystic Fibrosis Centre Charity. Rebecca Noonan, who has cystic fibrosis, officially opened the new rooms by cutting the ribbon .Dr Adel Mansour Clinical Director, the Cystic Fibrosis Team and ward staff, and senior management also attended. ‘Henry Smith was a highly successful wealthy entrepreneur who lived in London the 16th century. He gave a large amount of money to charity around 1549. He also owned property in central London. More recently, as a result of a sale of valuable property in Westminster, the Henry Smith Charity bequeathed £125,000 in 2002 to the West Midlands Adult Cystic Fibrosis Centre Appeal. 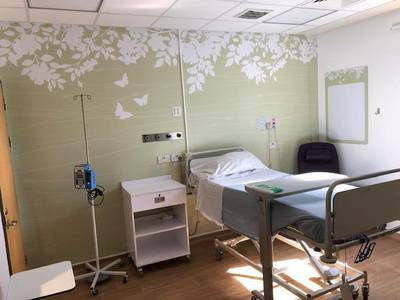 This enabled the development of a highly specialised 4-bedded unit within ward 26 at Heartlands Hospital including negative pressure facilities for those cystic fibrosis patients suffering from severe and transmissible infections. The Henry Smith Unit was refurbished in 2018 with donations of £60,000 from the Heartlands Cystic Fibrosis Centre Charity’. Our centre has been open since 2002 and we recognise that it requires updating and refurbishment. 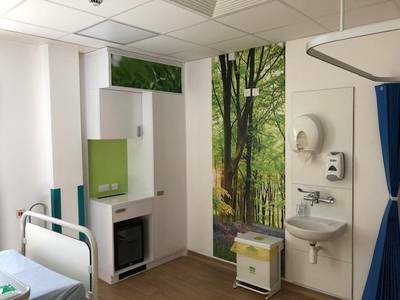 We would like to continue to raise money to fund the redecoration of the remaining 16 patient rooms. Please keep checking on our website for details of fundraising events we have planned for the year to come. If you would like to fundraise for our charity or make a donation please go to ways you can help.